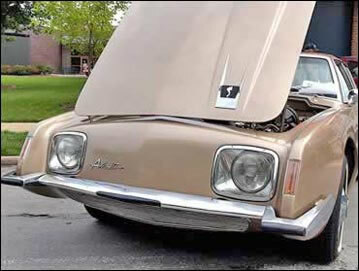 Raymond Loewy's design objectives for the Studebaker Avanti included "design hoods with off-center panel." This design concept was one of several favored by designer Loewy at the time of his commission to create a sports car for Studebaker. The large chrome and black emblem is mounted on the hood at the front end of a raised and creased protuberance that tapers and slopes into the hood from the interior cowl that houses the instrument panel. The base of this panel connects at the windshield with the interior cowl of the instrument panel forming a unified element that nicely integrates the interior and exterior of the vehicle and cleverly places the emphasis on the driver. The effect of connecting the driver to the forward motion of the vehicle is highly successful, yet has rarely been used in automotive design either before or after the Avanti. This assymetrical element adds a dignified flair to an already outstanding design, a perfect final inspiration. The Studebaker "S" and chrome base mounted at the front of the off center hood accent. 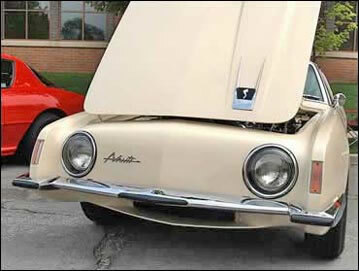 Studebaker logo and hood ornament on a 1963 Avanti. 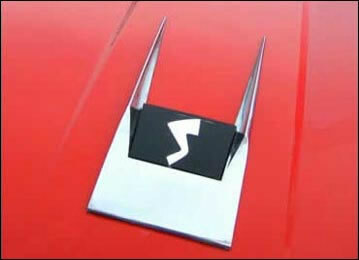 Studebaker logo and hood ornament on a 1964 Avanti.